The Chicago Department of Transportation (CDOT) and Chicago Transit Authority (CTA) are testing a new shared bus-bike lane concept during the reconstruction of the Chicago Avenue bridge. Starting Thursday, November 1, the city is closing Chicago Avenue between Larrabee and Halsted Streets to demolish and reconstruct the bridge over the Chicago River. The closure is expected to last three months. During this period, all 66 Chicago buses will be re-routed to Division Street via Larrabee Street and Halsted Street back to Chicago Avenue. 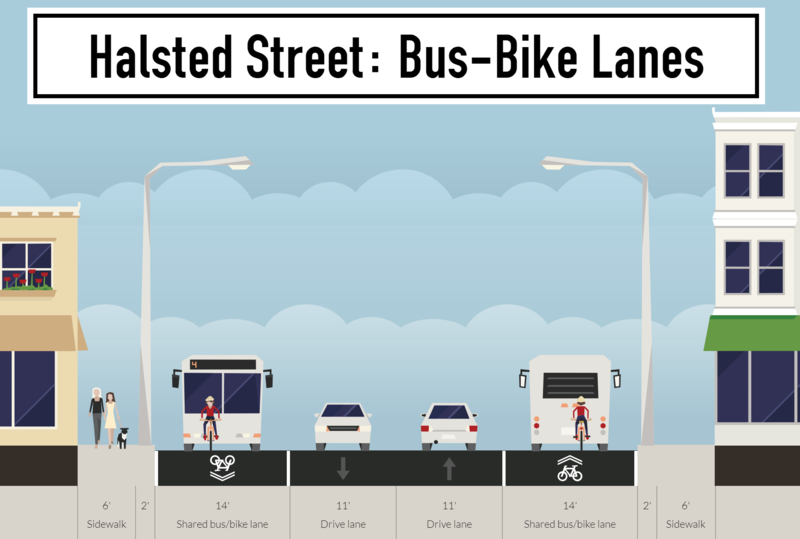 While on Halsted, buses will travel in shared curbside bus-bike lanes that will be separated from car and truck traffic with plastic posts. See a full map of the detour route. The 66 Chicago bus is the second most popular route in the system with 15,000 daily riders on this segment. According to CTA, every weekday the Chicago Avenue bus carries approximately 30 percent of all trips in only 2 percent of the vehicles from Western to Michigan Avenues. The bus-bike lane will also benefit riders on the 8 Halsted bus, which has more than 3 million annual boardings. Active Trans has been urging CDOT and CTA to give buses priority on city streets since launching the Back on the Bus campaign in 2017. Bus ridership in Chicago has dropped by 21 percent since 2012 as the speed and reliability of service has gotten much worse. Without more investment in bus service, Chicago risks more people abandoning transit for transportation options that are more expensive and less efficient, healthy and green. If you want to help remedy this problem, you’ll want to see Active Trans’ newly-released Bus Friendly Streets Report Cards, which covers all 50 wards and 8 priority bus routes, including Chicago Avenue. It’s encouraging to see city agencies testing a new way to prioritize non-auto travel. Lessons from this pilot could inform projects on similar corridors. Currently with a buffered bike lane, Halsted is a popular crosstown bike route in the city’s Streets for Cycling plan. During the detour period, buses from multiple routes will be traveling about two minutes apart in the shared bus-bike lane, which could take away some of the comfort for people biking. The current bike lane is not protected and next to a lightly used parking lane, so motorists often drive in the lane, especially during rush hour. The city hopes the plastic posts and bus traffic will help keep cars and trucks out of the lane. People biking can take the full lane and the CTA is instructing its bus operators to proceed with caution. Bus operators need at least three feet of clearance to pass people biking so there should not be any passing within the lane. People biking can pass buses on the left at bus stops. It will be important for people biking and bus riders to share feedback with cdotbikes@cityofchicago.org and feedback@transitchicago.com. Please cc transit@activetrans.org on your messages so Active Trans can monitor feedback and discuss it with both agencies. For people biking who are uncomfortable in the shared lane on Halsted, Elston Avenue is a nearby north-south alternative between Division and Chicago.